A boy discovers a bizarre looking creature while out collecting bottle caps one day at the beach. Realizing it is lost, he tries to find out where it belongs, but everyone else is too busy or wrapped up in their own lives to care. The boy decides it is up to him to find its home. 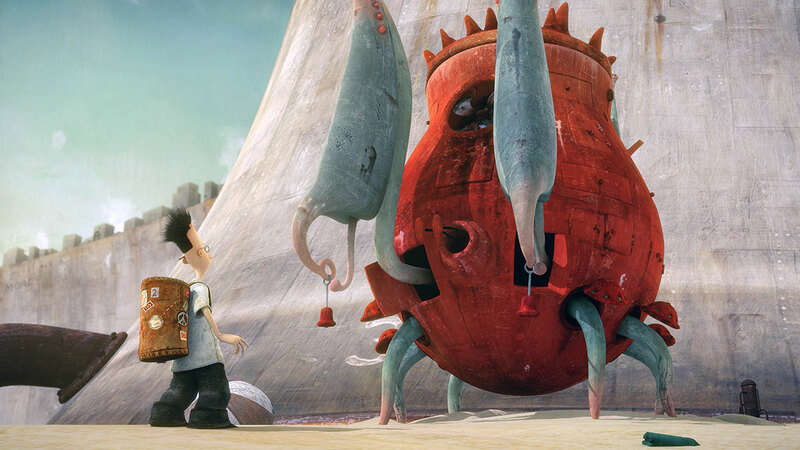 The surreal animation comes from the mind of children’s book writer Shaun Tan. A beautiful allegory exploring how we take for granted the world around us and how we ourselves at times feel like we don’t belong. The film won the 2011 Academy Award for best short animation. Directed by Shaun Tan and Andrew Ruhemann. – Learn more about the film at shauntan.net. – Read interview with the filmmaker at nytimes.com. Inspired in equal measures by Hurricane Katrina (the filmmakers are based in Louisiana), Buster Keaton, The Wizard of Oz, and a love for books, Fantastic Flying Books of Morris Lessmore is a story of people who devote their lives to books. The film is a poignant, humorous allegory about the curative powers of reading. The film uses a hybrid style of animation that harkens back to silent films and MGM Technicolor musicals. Directed by William Joyce and Brandon Oldenberg. The film won the 2012 Academy Award for best short animation. – Visit the film’s website at morrislessmore.com. – See the film’s Wikipedia entry at wikipedia.org.